I might actually have the worst time-management skills in the world. At 1:00 am last night, I was in my kitchen preheating my oven and seasoning my brand new cast-iron skillet. 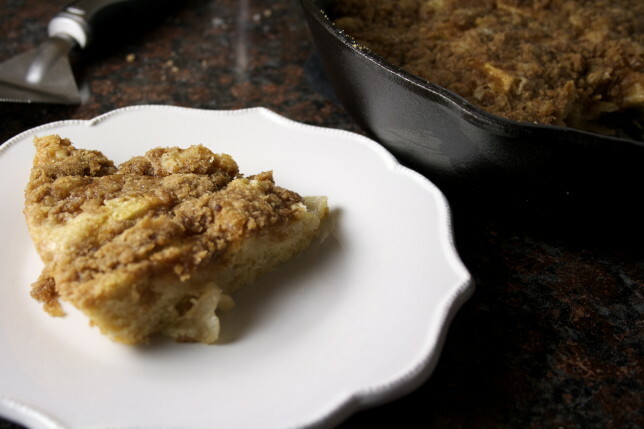 In my mind, the 1:00 am-to-2:00 am seasoning adventure was a time-saving initiative for today, when I would christen my beautiful new piece of cookery with this gorgeous, fluffy, delicious apple buckle. In reality, it happened because I baked up a dud in the test kitchen last night; spent a good deal of time wondering if this 12-inch skillet, which I bought at a discount home goods store thinking it was 10-inch, would serve my purposes long-term (I decided yes — worth the $15); thinking about whether I should season it tonight or in the morning; and researching, for maybe the third time this week, how one actually seasons cast-iron. Where in the baking gods’ name does the time go?? This is probably a theme you’re going to see here at the ImaginariYUM. The other thing is that I’m also Lucy Ricardo. Remember that episode of “I Love Lucy” where the gang goes to a restaurant, and Lucy keeps changing her mind about everything? What table they sit at, who sits where, what she’ll order. Yeah, that’s me. Especially the ordering part. I’m often absurdly indecisive about what to bake or what to eat. Unless I have a hankering for chocolate chip cookies or pancakes or penne alla vodka (all of which happened in the last few days), I sometimes get a little lost within my thoughts and my desires and I can’t decide on my best course of action. And then if it’s not a recipe already in my arsenal, I research, and research, and research. There are just so many options for so many different foods out there. What do I think will taste best? It sometimes will take me a week (or more) to figure that out. And then I test. And sometimes I fail. And then I take a break and wait for a new ingredient to arrive by mail and test again. And fail. And decide to just make something I know is delicious. Thank goodness this is one of those things. A buckle is a dessert (or breakfast item?) 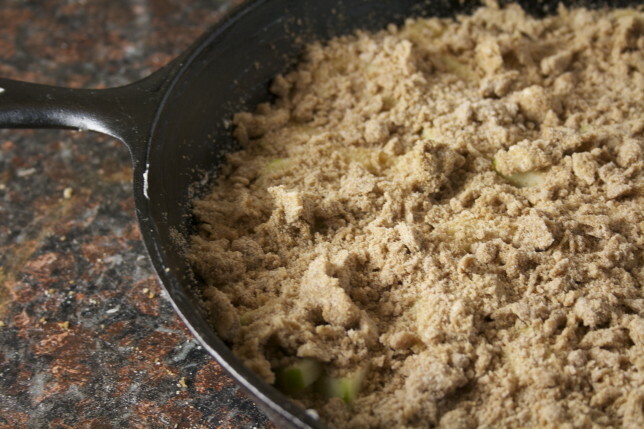 of the cobbler family, often prepared in a cast-iron skillet, sometimes with a streusel topping, other times with simply a sprinkling of sugar and nuts. It’s a cake that’s so moist and fluffy it’s almost custardy. It rises and embraces and envelops the fruit within it, giving it its tell-tale “buckled” appearance. This apple buckle is seasoned with your typical flavorings: cinnamon and a pinch of nutmeg, sugar and butter and vanilla. I know — apple season is over. But after over-indulging in the fall, I took a few months off, and I’m ready for more. Truth be told, I’m ready for peaches, but I’ll make do. This buckle is exactly the reason I was over-the-moon excited to find a cast-iron skillet in the home goods store when I wasn’t even looking for it. I just remembered I wanted one when I was wandering around and spotted a little stack of them. That day I was finally decisive. At 1:00 last night I was finally decisive. I’m pretty damn tired now, after getting up early and running and baking and preparing to face a deadline on another project. But at least I have an apple buckle to shove in my face as I stand down my demons and draw up a to-do list. 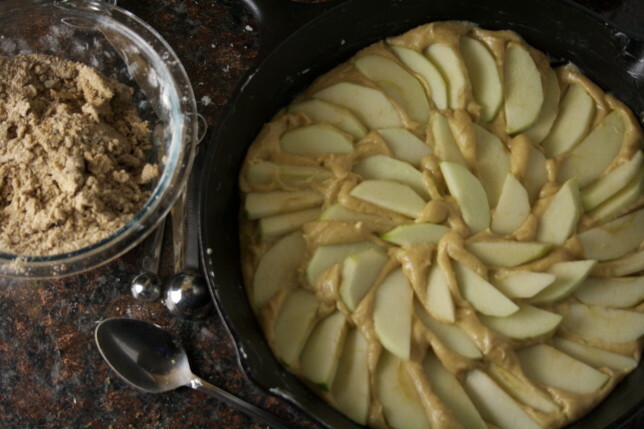 O, sweet apple buckle, give me fortitude. I used my trusty (new) 12-inch cast-iron skillet for this, but the recipe is intended for something a bit smaller, along the lines of a 10-inch skillet, which honestly I wish I had. It will definitely rise higher in a smaller pan, so make sure whatever you use (a 9-inch baking pan will work well, too) has at least 2-inch sides. The baking times will also vary depending on the size of your pan. I checked this baby at 35 minutes and, to my surprise, it was done. 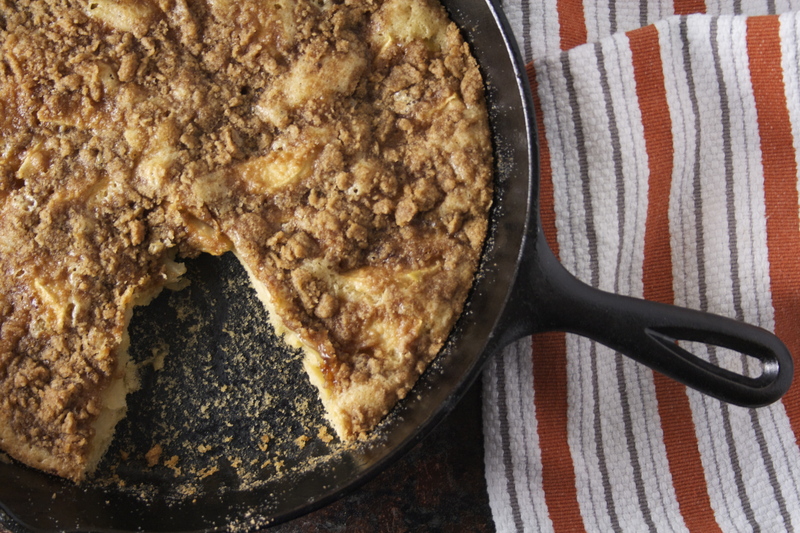 A 10-inch skillet or smaller will likely need more like 40-45 minutes in the oven. The recipe for the cake portion of this is adapted from a peach buckle recipe I’ve used for years from Martha Stewart, who tells us to spoon and level our flour (see the last post for more about measuring your ingredients). I weighed it and all the other larger quantities of dry ingredients — their metric weights are listed below. Edited to add that this is absolutely fantastic for breakfast. Pair it with a scoop or two of plain Greek yogurt and your hot beverage of choice — fabulous way to start the day. Preheat oven to 350 degrees with a rack in the center position. Butter skillet or baking pan or dish. Prepare your streusel in a small bowl: mix together flour, brown sugar, granulated sugar, cinnamon, and salt. Add the butter and, with your hands, work it into the sugar mixture until it’s crumbly. Set aside. 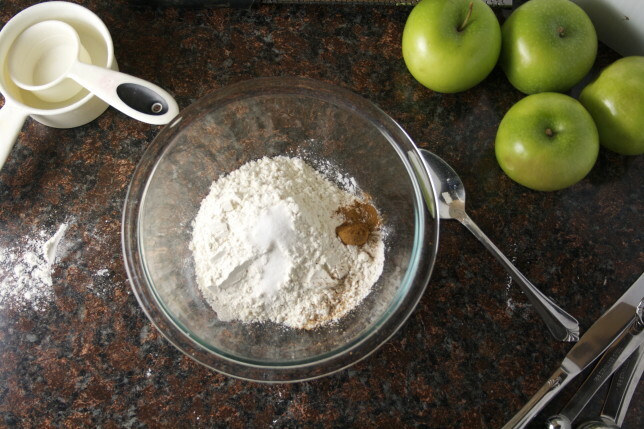 In a medium bowl, whisk together the flour, baking powder, salt, cinnamon, and nutmeg. Set aside. 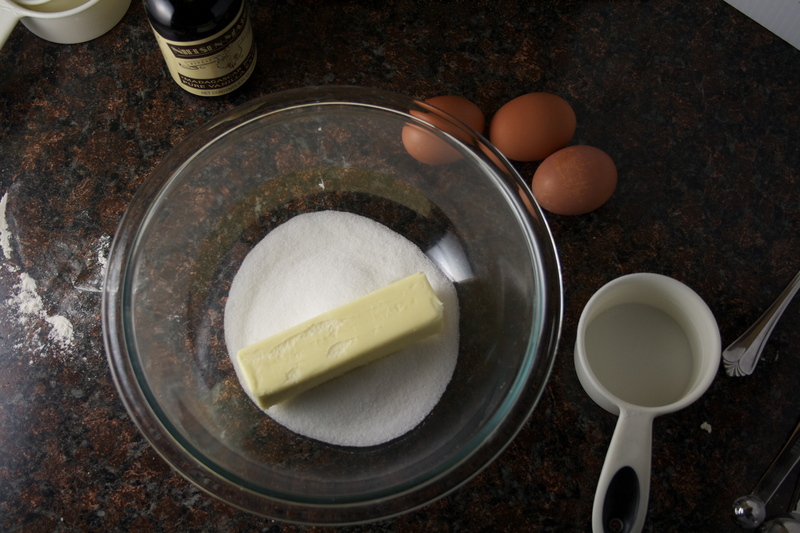 Using an electric mixer, cream butter and sugar in a large bowl until fluffy. Add vanilla and the eggs, one at a time, and beat to combine. 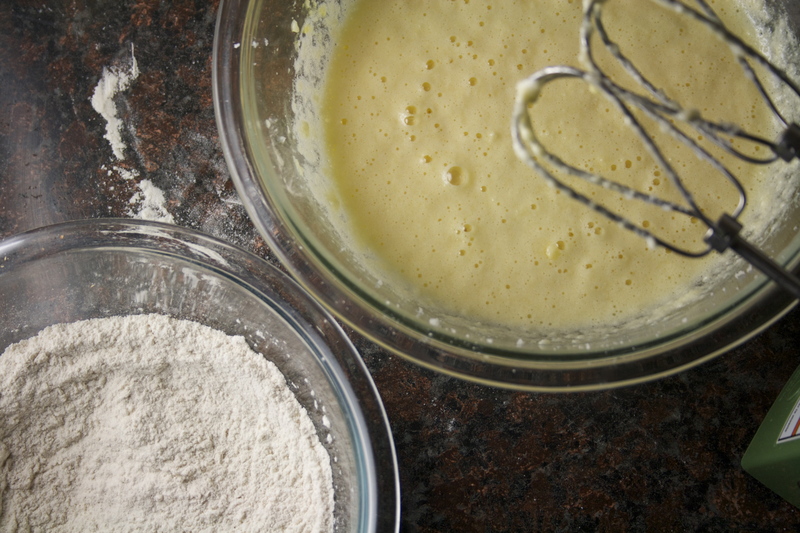 With the mixer on low, gradually add the flour mixture to the wet ingredients and beat until incorporated. Spread batter into prepared skillet. 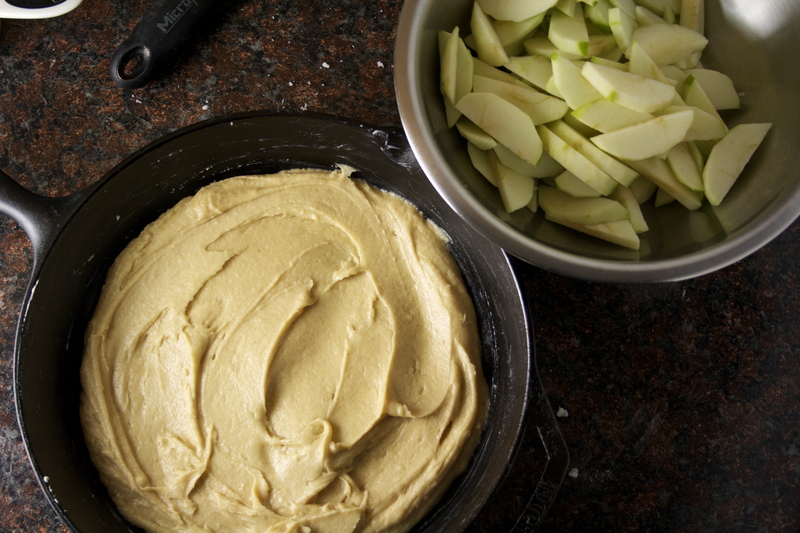 Working from the outside edge of the pan, press the apples into the batter in a fan pattern (alternatively, you can fold the apples directly into the batter before spreading it into the skillet — it just won’t be as pretty, which is probably fine since we’re covering it with streusel anyway). Sprinkle the streusel over the cake, clumping it together in your palm before releasing it in smaller pieces with your fingers. Bake for 35 minutes, or until a toothpick inserted into the center comes out clean. If using a skillet smaller than 12 inches, your buckle will likely need at least 40-45 minutes.